This single is backed with different tracks in different countries. Although this was by far not the first widely known Australian rock song (that honour goes to "Friday On My Mind" by The Easybeats), it is the one that is most referred to as "Australian Rock". The funny video did help achieving this and it was one of the first MTV music videos. 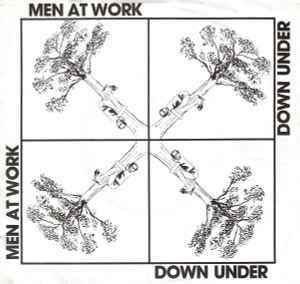 Somehow, it also started the expression "down under" as a common reference to Australia since then. 1. first verse, first line ("traveling in a fried out combie") misheard in German as "satt und leer in 'nem feigen Kamel" (drunk and empty in a foul camel) and in Dutch as "ik zat alleen in een vuile kameel" (I sat alone in a dirty camel). 3. third verse, first line ("dying in a den in Bombay") misheard in German as "keine Antennen in Bombay" (no antennas in Bombay).